Photo Prints that Jump off the Page! Enlarge your photos on our high quality photo page. The prints will last for hundreds of years. 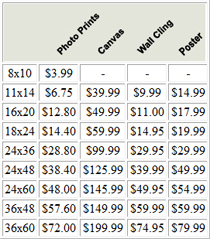 Take your digital pictures and show them off with gorgeous large format prints. Copyright © 2012 KSMemories.com. All rights reserved.